The Lady Bulldog soccer team came out firing Thursday afternoon against Class 6A Alamogordo at the Mack Chase Athletic Complex, twice taking the lead in the first half before the Lady Tigers were able to gain the upper hand, 3-2 at the break. But Alamo dominated the possession game in the final 40 minutes of play, and the result was a 4-2 loss for the girls in orange. 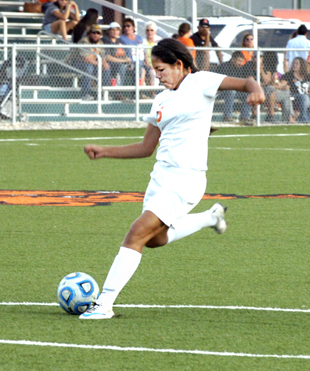 Artesia’s first goal came just over two minutes in when the Lady Tiger defense got careless clearing a corner kick, inadvertently knocking the ball into their own net. Alamogordo would tie things up a few minutes later, but sophomore Elisa Cardenas broke away with the ball at the 27:47 mark, firing one in to put the Lady ‘Dogs back in the lead, 2-1. Artesia battled for 20 minutes to hold onto that advantage, but with 7:33 on the clock, the Tigers were able to reinstate the deadlock. Alamo then caught the Lady ‘Dog keeper out of goal near midfield with under two minutes to go in the half for an easy go-ahead shot. The Artesia girls were hard pressed to create offensive opportunities in the second half, taking just four shots on goal to Alamogordo’s 13. The Lady Tigers logged their final goal with 6:11 remaining in the contest on a chip shot over the goalie’s head into an open net to set the score, 4-2. With the loss, the Lady ‘Dogs drop to 5-6 on the season following their 6-1 defeat at the hands of 6A Clovis Tuesday. That contest saw the Lady Wildcats outshoot Artesia 14-4 in the first half, connecting on a trio of goals all 10 minutes apart. The Lady Bulldogs would go in at the half trailing by just two, however, following a goal by Raina Wesson at the 7:04 mark. The Lady ‘Dogs created a few more chances in the second half but were unable to find the back of the net again, while the ‘Cats scored thrice more, their final goal coming with 3:40 left to play. The Artesia girls now have just two remaining road games separating them from the start of District 4-AAAAA play. The squad will travel to Carlsbad Tuesday for a 6 p.m. bout against the Cavegirls – who defeated the Lady ‘Dogs 2-0 Sept. 8 at The Mack – and to Portales Saturday for a 3 p.m. game against the Ramettes.